On December 19, researchers, with the help of the U.S. Deparmtent of Energy, set off a 50-ton chemical explosion hundreds of meters below the surface of the Mojave desert, Science Magazine reports. The resulting artificial earthquake allowed NASA scientists to test out special earthquake sensors hanging below helium-filled balloons that were floating hundreds of meters above the desert. 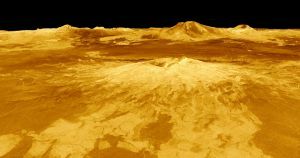 NASA is hoping that a similar system could one day take detailed seismic measurements above the surface of Venus. The goal is to eventually discover clues about the planet’s internal structure. The idea of using balloons to collect data about our “evil twin” planet has been around since at least 2014. A futuristic — but no longer active — concept called High Altitude Venus Operational Concept (HAVOC) suggested we could one day go on 30 day missions into Venus’s atmosphere on board special lighter-than-air vehicles. So why balloons? Landing a rover on Venus to collect seismic data is practically impossible. Venus’s dense atmosphere of mostly carbon dioxide is so hot it could melt lead — average temperatures are estimated to be 864 degrees Fahrenheit (462 degrees Celsius). The outer atmosphere is a lot cooler, and would be a far more suitable place to conduct scientific experiments from. But how could a ballon floating up to 31 miles (50 kilometers) above the surface of Venus be able to detect seismic activity? Venus’s incredibly dense atmosphere is results in pressure that’s equivalent to 3,000 feet below the ocean back on Earth. In such a dense environment, seismic waves could travel far easier from the surface to the ballon. But there’s a lot about Venus we don’t even know yet — let alone if there’s any seismic activity to begin with. The results from the explosion might also not translate to the harsh environment of Venus’s atmosphere. But it’s a clever solution that could one day allow us to get to know Venus a whole lot better. The post NASA Wants to Send Earthquake-Detecting Balloons to Venus appeared first on Futurism.